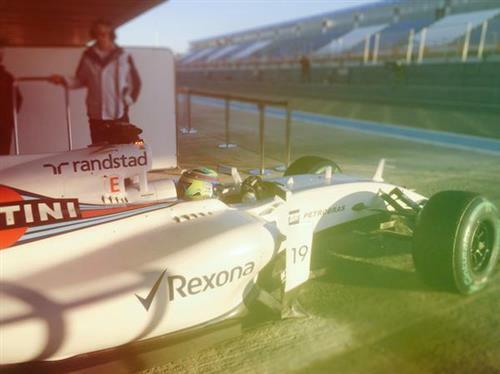 Hello and welcome to the start of the final day of testing in Jerez this week. It's another damp start to the day after overnight rain, but the sun is appearing from some clouds to the east and should be beating down over the track soon. Just like the McLaren-Honda, we've had a few "technical" problems this morning, but we've made it here just before 9am. Let's see if Jenson Button and the boys from Woking can match (by which I mean massively surpass) our technological achievement by getting the MP4-30 on track just as it opens. So the track conditions are similar to yesterday's? @CrM: Actually not as damp as yesterday. And it should dry quicker now the sun has burst out from behind the clouds. Lewis Hamilton is first out of his garage but Kimi Raikkonen passes him as they leave the pits. That Finn is waiting around for no-one. Ericsson, Verstappen, Kvyat and Massa have also gone on track for an early installation lap. Because he knows what hes doing. So leave him alone!!! @Phil: Yep, that's the main objective for everyone this week, although I think it's fair to say Mercedes is the only team that has got close to achieving it. Ericsson sets the first time of the day with a 1:58.596. Plenty more to come today. Esteban Gutierrez is stood on the pit wall watching the action. He has a very fetching bright red jacket and headset, but I bet he'd trade it in for his old Sauber seat. Any more rain expected during the day? @AndreasJSNaudé: I believe the forecast is for sun and clouds today. No rain. 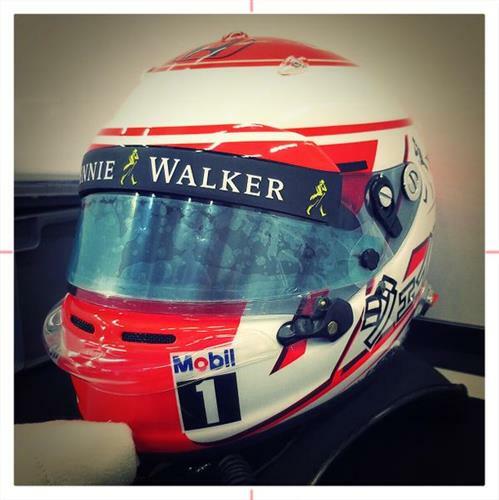 what is the strange looking grid at the end of the sidepid on Lewis car? @hacke: That's there to measure the airflow coming over the car before it reaches the rear. Fairly normal kit for testing. Grosjean has gone out for his first lap of 2015 in the new Lotus E23. He's been here since Monday looking pretty excited about the new season. @CrM: Indeed. I interviewed him yesterday and he was clearly pretty angry with himself: "I’m just looking forward to tomorrow to making up for a sh*t day, that’s all." You'll be able to read that interview in full later today. We'll post a link here for easy access. Indeed it is. Just being warmed up for now. But we should see it soon. Are they on full wet now ? @GregTan: I didn't see all the cars from my vantage point, but it was mainly inters for the installation laps. Slicks will come quite soon though as the damp track gets warmer. Thanks ESPN for bringing us these live updates and commentary. I have been glued to your page since Sunday. Keep up the good works!! @Lubs: Good to have you along. Cant wait to hear the sound of the Honda if nothing else. Have to wait for Melbourne for that I guess! @Dark_Tower: I'm not sure it will translate on TV. But if you have the chance to come and see it in the carbon fibre then make sure you do. It's a good day when you have some kind of F1 event to follow. Ferrari performance was good last year in Jerez.. 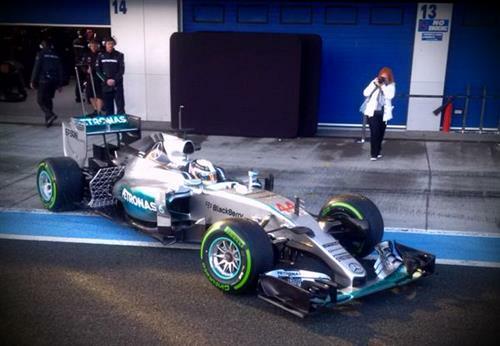 So no worries to Merc..
@girish: Yes, I think everybody accepts that Mercedes is still the team to beat. Vettel said on Monday that even if Mercedes did no laps in Jerez this week they would still be favourites. So far they've done 398. Hi, I'm planning to visit the last pre-season test end of Feb. in Barcelona as i did 2 years ago... do i still need ear plugs with these hybrid 'engines'? @Martijn: Not unless you have very sensitive ears or you intend to go sniffing the exhaust as they start it up. The nice thing is that you can actually have a conversation trackside while they run, although personally I'd rather stand in silence and let the cars do the talking. @Martin, you will need hearing aids to hear the engine noise. Is it only the McLaren that sounds different/louder, or other cars as well? @CrM: The Honda sounds different to the others, definitely, and a tad louder. Unfortunately I still haven't been able to leave the confines of the paddock this week (I will today) to get a proper listen. The sad news for this year is that the Ferrari no longer makes little "pow" noises on downshifts. And as I type the Honda fires up again ... Button makes it just out of the garage and then stops. Photographers swarm around the car and he is pushed back into the garage. Not the best of starts to the final day. Meanwhile, Ericsson, Hamilton, Massa, Grosjean and Raikkonen are on track again. Sky Sports Commentator Ted Kravitz said in an interview yesterday, that, it would still be Rosberg vs Hamilton part-2 this year. Does this mean, Mercedes will still dominate this year no matter what progress other team does? ?